BIRMINGHAM accountants Moore Stephens has launched a partnership with the team behind a new programme influencing generations of young people to be part of the construction industry. Built Environment Skills in Schools (BESS) is a 10-year programme which highlights all the initiatives, programmes and projects that exist in the construction sector – reconnecting students, educators and employers. 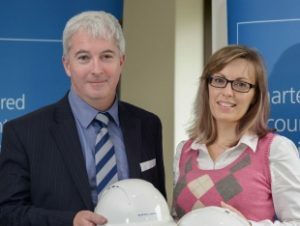 The programme has been launched by Birmingham-based behavioural change expert Kathryn Lennon-Johnson and is linked to the Construction 2025 Strategy – a joint strategy from government and industry for the future of the UK construction industry. BESS uses the Hot 500 Hub peer learning social network to host a range of information and activities which young people can access – depending on where their interest lies. By summer 2017 BESS aims to reach all senior schools in England, along with colleges, academies, independent schools and universities – providing a direct link between the construction sector and more than 15 million young people between the ages of 11 and 21. Influential organisations across the construction industry have already signed up to support the programme. The real estate and construction team at Moore Stephens has become one of the first gold supporters of the programme. Ms Lennon-Johnson said: “The programme is really starting to take shape and gain strong traction with schools, colleges and businesses. “While other organisations are doing incredible things to try and tackle the skills gap, there is still an uphill battle to get young people interested in the construction industry. She said by bringing all the pathways to the industry under one umbrella and using social media networks, gaming and virtual 3D modelling to capture young peoples’ imagination, the organisation was hoping to identify topics children could relate to. “Hundreds of young people and schools are actively using the system – learning about live construction sites and projects in ways that appeal to them,” she said. Paul Fenner, head of real estate and construction at Moore Stephens, added: “The construction industry has reported that an additional 230,000 workers will be needed in the UK in the next five years, and this figure is only going to grow and grow unless serious action is taken by the sector. BESS is working closely with key players in construction including the Royal Institute of British Architects (RIBA), Construction Industry Training Board (CITB), Construction Industry Council, Institution of Civil Engineers (ICE), the Royal Institution of Chartered Surveyors (RICS), Birmingham City Council, Moore Stephens, and leading multi-disciplinary engineering and environmental consultancy, MLM. Gimme an E, Gimme a V… EVIDENCE! 12th October 2016 kathryn@BESS Comments Off on Gimme an E, Gimme a V… EVIDENCE!